Several of Guanacaste's coastal national parks protect critical sea turtle nesting beaches. Santa Rosa National Park, the oldest in the region, is home to two of these beaches, Naranjo and Nancite ­ but both are difficult to get to because of poor road conditions. The seven-mile dirt road from the park's administrative buildings to Naranjo Beach is normally passable only in the dry season with a four-wheel drive vehicle (check with the park service before attempting this drive). Nancite Beach is restricted because of turtle nesting research programs, and advance permission is required to visit this beach, which involves a difficult hike from Playa Naranjo. However, Guanacaste's other two protected beaches have relatively easy access. A newcomer to the list of Costa Rican national parks, Las Baulas Marine National Park was created to protect two important nesting beaches for the Giant Leatherback Sea Turtle (Dermochelys coriacea), as well as conserve offshore areas where these large marine reptiles spend their days during the breeding season. Leatherbacks, known as baulas in Costa Rica, are the largest of the world's seven species of sea turtles, averaging 350 kg. (772 lbs.) and measuring more than 1.5 m. (about 5 ft.) in length. Watching one of these great ancient beasts come ashore at night to continue the age-old tradition of nesting in tropical sands is a very moving experience for most people, although others find the two-hour process a bit more than their patience and interest can tolerate. 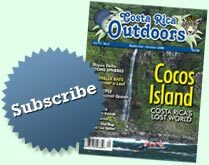 In Costa Rica, this species can be found nesting at a number of beaches on both coasts, however, two of the more heavily used beaches are Playa Grande (Big Beach) and Playa Langosta (Lobster Beach), to the north and south, respectively, of Tamarindo Beach. Together, the aforementioned two beaches make up Las Baulas Marine National Park. The nesting season at Las Baulas extends from October through February. All visitors on the beach at night must be accompanied by a certified local guide (available at the entrance to the beach). When away from their breeding sites, leatherbacks range widely throughout the world's oceans searching for their principal food, jellyfish. Further south on the Guanacaste coastline is Ostional National Wildlife Refuge. This refuge was designed to safeguard a major nesting beach for Pacific Ridley Sea Turtles (Lepidochelys olivacea), along with the adjacent offshore area. 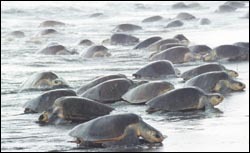 Several times a year, female turtles come ashore in such numbers that the sandy beach begins to resemble a stretch of rocky seashore. These mass nesting episodes are locally referred to as arribadas, or arrivals. One of these events can last from two to eight days with most nesting taking place at night. Locals will tell you that the arribadas begin three or four nights after the full moon, and this is typically the case in months when relatively small numbers of individuals nest. But during the peak nesting season (July through November) when more than 100,000 nests may be made during a single arribada, any correlation with phases of the moon or the tides breaks down completely. What triggers the mass nesting is still a mystery. Scientists suggest that this species produces a superabundance of nests as a strategy for survival against predators. By laying so many eggs in just a few nights (a million or more during a large arribada) it is unlikely that local natural predators could possibly consume them all. Likewise, when the surviving eggs hatch and the young turtles scramble down the beach to the ocean, if thousands of them are doing this at more or less the same time, then some percentage of them ought to escape the variety of hungry predators that range from crabs to coyotes. However, natural predators are no longer the only threat facing each new generation of sea turtles. The creation of the Ostional National Wildlife Refuge is a wonderful example of the "if you can't beat 'em, join 'em" philosophy in conservation. For many years, the wholesale ransacking of turtle nests for eggs was a seasonal activity indulged in by people from all over the region, and even from as far away as San José. The widespread belief that consumption of turtle eggs produces aphrodisiacal effects has given them popular demand as bocas (snacks served as appetizers in local cantinas). Hampered by insufficient funding to adequately patrol the beach at Ostional, while at the same time needing the support of the local villagers, wildlife authorities proposed a new scheme with the declaration of the refuge. The proposal was that Ostional residents, and only Ostional residents, would be granted permission to harvest a limited number of eggs during the first two nights of each nesting period. These eggs could then be sold only to bars with licenses to serve turtle eggs. The idea was to get the local populace to function as a police force to safeguard their own interests and protect the later nests at the same time, since the later nests have a better chance of success (early nests are often inadvertently excavated by turtles arriving later on during an arribada). This novel policy has generated much debate, but it seems to be working effectively. Vehicular access to Ostional is somewhat challenging, and a four-wheel-drive vehicle with good clearance is definitely recommended, especially if going in the wet season when the bulk of the sea turtle nesting occurs. Nonetheless, this beach is far more accessible than the only other beach in the country where this phenomenon occurs, Nancite Beach in Santa Rosa National Park. Ostional can be reached from either the town of Santa Cruz or Nicoya (both situated on the main highway that runs down the middle of the Nicoya Peninsula), and following a series of gravel and dirt roads to the coast (at Playa Junquillal if coming from Santa Cruz, or Playa Nosara if coming from Nicoya) and continuing south or north, respectively, until arriving at Ostional. Although more direct, the route via Nicoya-Nosara involves fording a river which can be impassable at times in the rainy season.